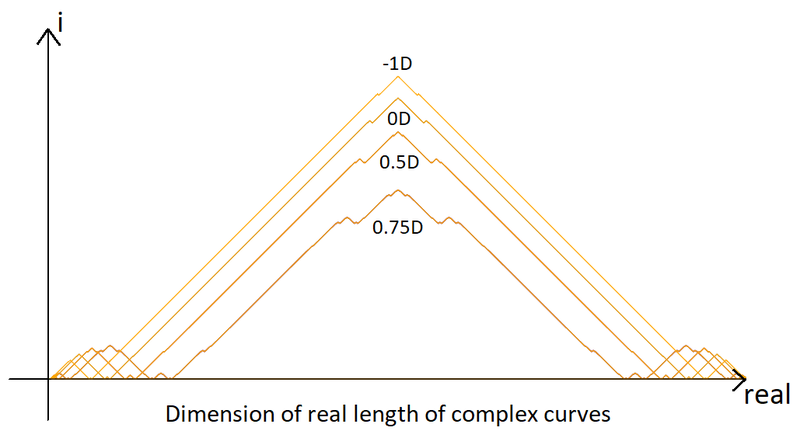 We all understand geometry of integer dimension and fractal geometry describes shapes with positive fractional dimension, but there are only a few descriptions on how shapes could have negative dimensions. In fact I know of three. 1. A negative dimensional space as described by V Maslov considers gaps in a solid as negative dimensional, presumably a solid missing a line is -1 dimensional and a solid missing a plane is -2 dimensional. This seems to be incorrect as it is confusing measure with dimension. If anything one might think of the holes as having negative measure (relative to the solid). 2. 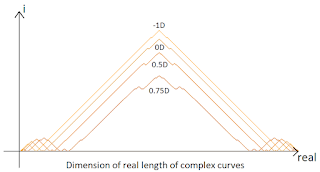 Benoit Mandelbrot had a definition of negative dimensions when you are describing the intersection of different shapes under a small amount of noise. The intersection of a point and a volume is 0 dimensional, a point and a plane is -1 dimensional, a point and a line is -2 dimensional and between a point and a point is -3D. The idea is that as you look more closely the likelihood of intersection within a reducing size ball reduces at different rates for these cases. It is a nice idea which removes a special case in a certain set operator equation, but it assumes noise so is a somewhat specific definition. It also creates some odd cases such as a 1D plane (if you a intersecting it with a plane) and intersecting more than two sets gives unbounded negative dimension. In fact it is a specific type of idea 2, as the dimension is being defined for a concept (the intersection of sets) rather than just sets. 3. Lapidus has a formulation that allows for negative relative dimension on subsets of a manifold. Essentially a point at the end of a manifold that it pinching into a corner can have negative dimension relative to the manifold that it is in. This is interesting, but it is a relative measure, and requires some specially constructed manifolds to achieve. 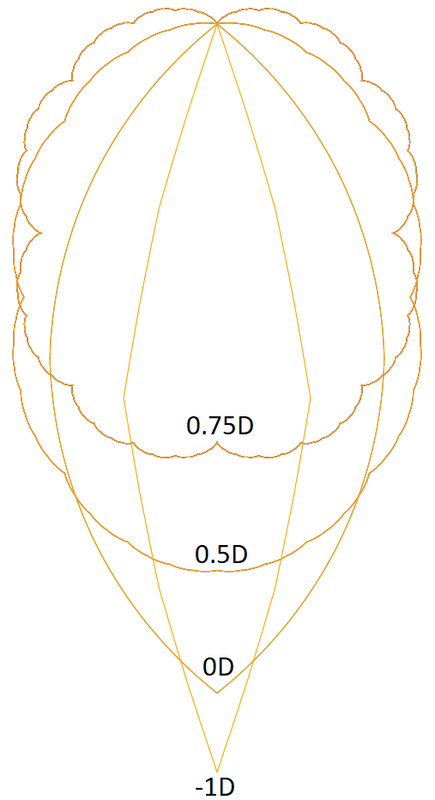 This particular family of curves is the 1+1D Minkowski equivalent of a Koch curve in 2D Euclidean space. In fact, we can think of the Koch curve, the Weierstrass function and this curve to be the same type, only differing by whether the second dimension squared is positive, zero or negative respectively. 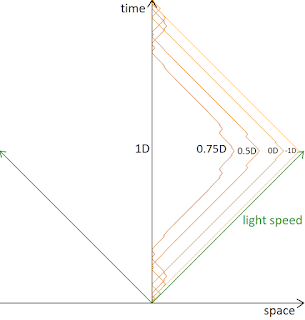 And accordingly the larger angles increase, make no difference and decrease the dimension respectively, from a 1D line. 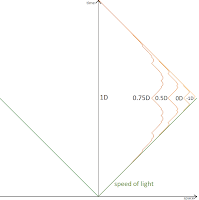 In 2+1 space-time the results represent a point moving around in 2D and are perhaps more visually interesting. Here I follow the replace pattern of the Koch curve in 2D space, but the bend angle doesn't increase the curve length by a fixed percentage (like the Koch curve), instead it is achieved by boosting the motion in order to decrease the proper time by a fixed percentage. 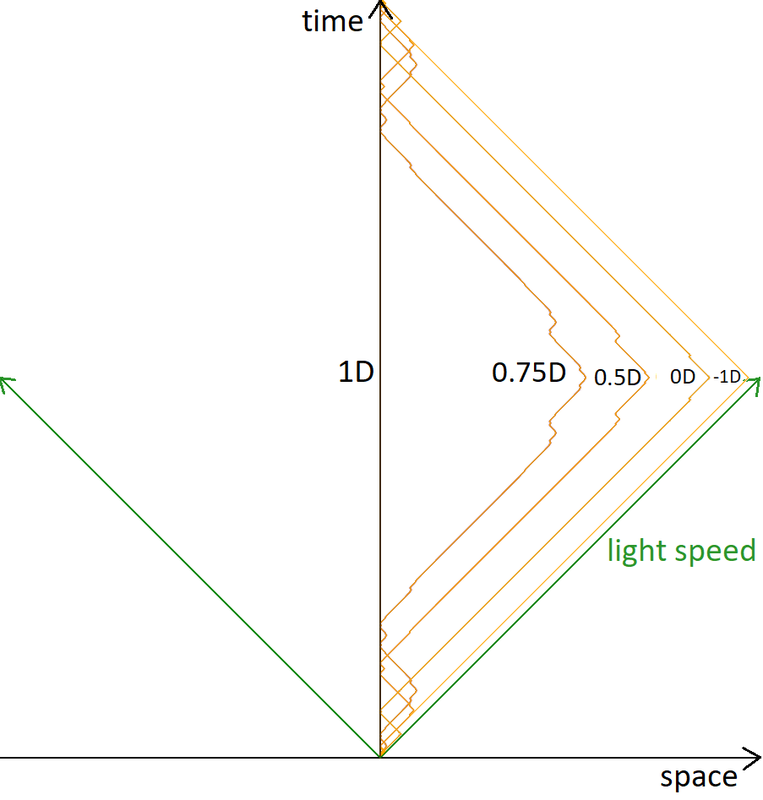 As a result the dimension decreases and the measure is of the proper time, meaning we quantify the period of the motion as the time according to the point, in seconds^D where D is the dimension. This effect is a bit like the internal scattering of light in some medium. Lower dimensions are like there are a greater range of particle sizes, with few that cause large reflections and many that cause tiny course changes. D=1 is like all particle sizes (or scattering angles) are the same. So far we have said that the proper time of the trajectory has some dimension b. We could also piggyback the a+bD syntax for Lorentzian space-time to say that the overall geometry has dimension 0+bD, i.e. the temporal dimension is b and the spatial dimension is 0. If we moved a line along this trajectory then it would be 1+bD geometry. 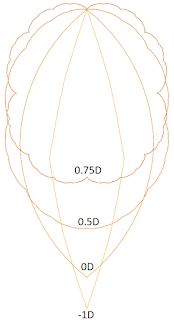 It has some similarity to the Hevea project curves, but the above paths are actually moving points with a fractional dimension, despite their smoothness. 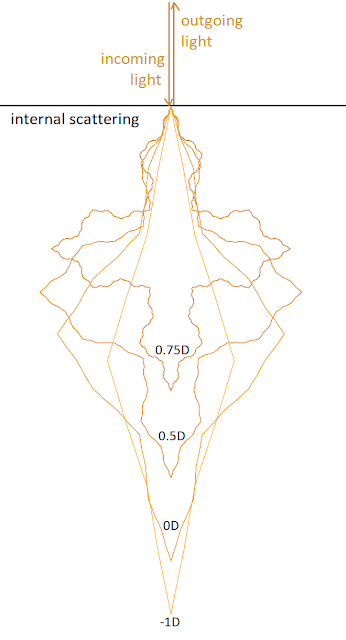 In the next post I give a general proposal for negative dimension geometry for the more common Euclidean space. Notice that the 0D curve appears like two circular arcs. I don't know if they are perfectly circular or indeed perfectly smooth, but it is certainly close in both cases. 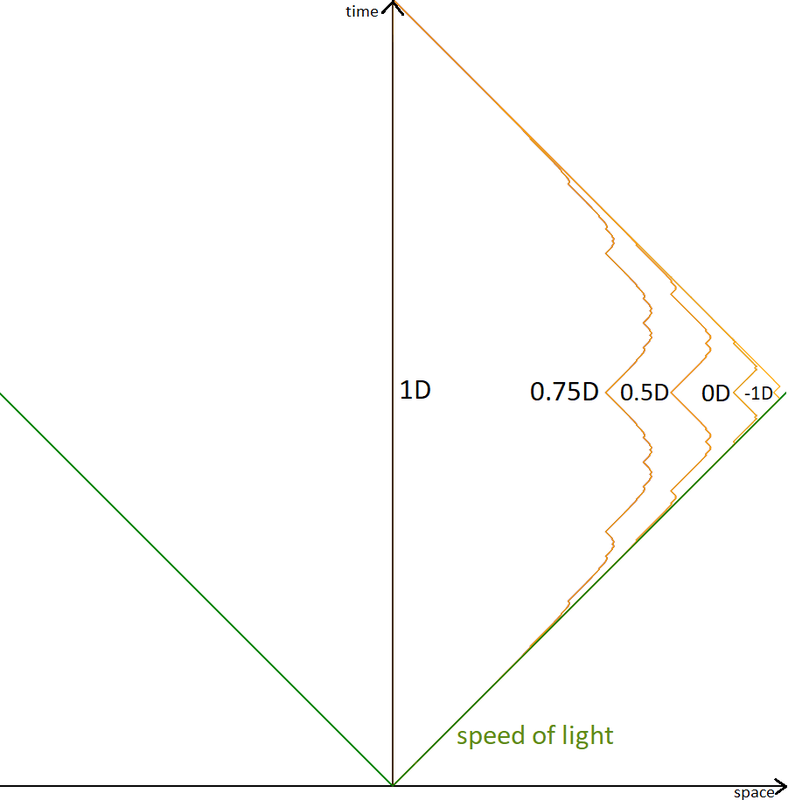 There is certainly something interesting about the fact that the smooth path has dimension 0, it is perhaps even obvious that it should, since light-like motion has zero proper time so is 0D.